Pearls have been prized since ancient times for their natural beauty and their ability to embody timeless style without further enhancement. Symbols of love and glamour, they have been adored and admired by Emperors, Kings and Queens throughout history and across cultures. Today, pearls have worked their way into nearly every woman’s wardrobe, working just as well with a stylish dress for a night out as they do with a well-worn pair of jeans. As society has become more casual, it’s truly not uncommon to find a way to work pearls into your daily wardrobe. But even though you may have the best outfit in mind, you should understand the basic differences between the types of pearls before you decide to start an Add-A-Pearl necklace or buy your first set of pearls. The first, and most basic, distinction to make is natural versus cultured pearls. Oysters have a hard protective exterior shell but soft delicate bodies on the inside that need protecting. Often times, small bits of shell, fish scales or other foreign bodies get caught on the inside shell wall and are unable to be dislodged. To protect its soft body, the oyster secretes nacre and conchiolin which coats the irritant to form a pearl. Nacre is made up of crystallized calcium carbonate that is mother of pearl. The smooth coating is attached to the irritant by the conchiolin which acts like an adhesive and is only produced to bond the first layer of nacre to the irritant. Throughout the pearl’s life, the sac continuously expands to form micro-layers of nacre around the irritant which gradually increases the size of the pearl in a process that takes years. The Arabian Gulf was the world’s first source of natural pearls and remained so for centuries. Together with pearls from the Red Sea and the Strait of Manaar, they have been referred to as “oriental” or “genuine” pearls. What type of oysters are they formed in? Both natural and cultured pearls come from bivalves which are a family of living shelled mollusks that are made up of two shell halves that open and close for feeding. Most people think that oysters are the only shellfish that produce pearls, but that isn’t the case as both mussels and clams also have the same capability - although it is much more rare. What do natural pearls look like? Natural Pearls tend to be darker cream with more hints of yellow or champagne undertones. The luster of natural pearls tends to be deeper although more subtle than the high-gloss luster of cultured pearls. How rare are natural pearls? Natural pearls are extremely rare. It is estimated that one of every 10,000 oysters will produce a pearl spontaneously. Of that number, even fewer will be round and lustrous enough to be usable for fine quality jewelry. A large natural pearl is a very extraordinary phenomenon of nature. Their rarity coupled with the rising awareness of their history and value has made natural pearls a rediscovered treasure. Although they are technically formed by living organisms, their creation is expedited by the simulation of ideal conditions. Pearl harvesters place shell beads inside an oyster, then return the oyster to the water. Over time, the oyster covers the bead with nacre, forming a pearl. Later, the oyster is recovered from the water and the pearl is removed. Depending on the type of oysters selected for pearl harvesting, different sizes and colorations result. As a general rule, larger oysters produce larger pearls. The vast majority of the world's cultured Akoya pearls are produced in Japan, which has been known as the cultured pearl producing center of the world. What type of oyster are they formed in? Cultured pearls are formed in the Pinctada fucata (martensii) also known as Akoya oyster. The Akoya oyster is the smallest of the commercially farmed pearl producing oysters, so it doesn’t usually produce a cultured pearl larger than 9mm. What do cultured pearls look like? 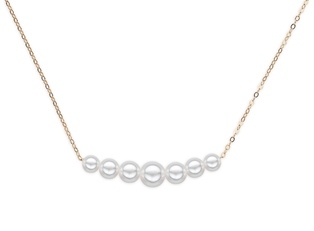 Akoya cultured pearls are known for their perfectly round shape and bright reflective luster. Akoya pearls are considered the classic pearl and are what most people think of when pearls come to mind. They are generally creamy white with rose overtones. ARE NATURAL PEARLS MORE EXPENSIVE THAN CULTURED PEARLS? Yes! Natural pearls are considerably more expensive than cultured pearls. One might argue that the reason we have cultured pearls is because natural pearls are so much rarer and simply cannot meet consumer demand as they need to be formed spontaneously by nature. That said, natural pearls have regained popularity in recent years. People are drawn to the unique, imperfect perfections of natural pearls. In fact, auction houses have reported that natural pearls are setting records as their value continues to skyrocket. While cut or mined gems are still stylish, they do not carry the same subtle beauty and unique story that goes into each natural pearl. In comparison, cultured pearls are cultivated on pearl farms in fresh or salt water by people who stimulate the process of pearl creation. As a result, cultured pearls are usually less expensive than natural pearls since they can be produced in greater numbers, albeit in exchange for some of that truly unique process of a naturally occurring pearl. Since the Akoya oyster is relatively small, Akoya cultured pearls are rare in larger sizes over 7mm. That rarity makes it common to find top-quality Akoya pearl strands retailing for more than $10,000 – much higher than a comparable freshwater cultured pearl. Although diamonds may be forever, the natural and rare beauty of pearls has been prized for centuries longer than any cut stone. Almost all other gemstones are formed by mineral deposits that must be mined, cut, and polished to reveal their true beauty while pearls are beautiful as they are. High quality pearls have a deep rich inner glow that emanates from within the gem, something else that just simply cannot be mimicked in other gems. So whether you decide on natural or cultured pearls, these lustrous jewels are sure to maintain their value, versatility, and beauty, captivating any woman throughout her lifetime. Learn more: Saltwater or Freshwater Cultured Pearls: What's the Difference?